1. WE USE ONLY 18 OZ. LAMINATED NYLON OR 18 OZ. LAMINATED POLYESTER FABRIC THAT IS WASHABLE, FIRE-RETARDANT, MILDEW AND SCUFF RESISTANT. 2. WE USE A NUMBER 10, NON-CORROSIVE ZIPPER AND A NUMBER 10 SLIDER ON THE ZIPPER. 3. THE 1 1/2 AND 2 INCH POLYPROPYLENE WEBBING THAT WE USE FOR STRAPS IS GOOD FOR 600 TO 800 POUNDS. 4. ALL SEAMS ARE SEWN TWICE TO INSURE STRENGTH, USING A NUMBER 12 OR NUMBER 92 BONDED POLYESTER THREAD. 5. THE ZIPPER IS COVERED WITH A FLAP AND THE FLAP HAS A CONTINUOUS STRIP OF VELCRO THAT KEEPS IT CLOSED. 6. THE STRESS POINTS AT THE STRAPS AND ZIPPER ENDS ARE REINFORCED. 7. THE SIDE SEAMS OF THE SMALL, MEDIIUM, AND LARGE BAGS ARE SEWN, ROLLED AND SEWN AGAIN TO MAKE THEM AS WATER TIGHT AS POSSIBLE. 8. OUR FABRIC IS TOTALLY WATERPROOF AND WE FEEL THAT THE BAGS ARE AS WATERTIGHT AS A SEWN BAG CAN BE. ANYTIME THAT YOU HAVE A SEWN SEAM, YOU HAVE THE POSSIBILITY OF MOISTURE GETTING THROUGH. THIS IS THE REASON THAT WE SEW ALL SEAMS TWICE AND THE REASON FOR THE FLAP AND VELCRO OVER THE ZIPPER. 9. 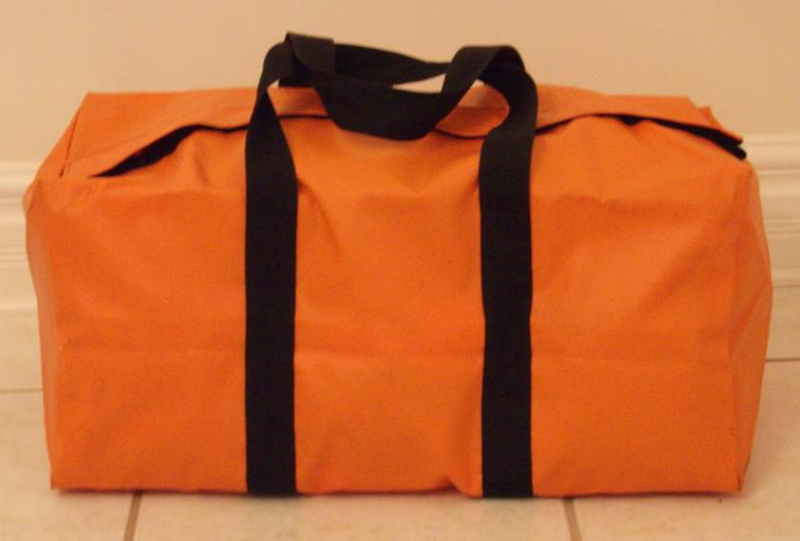 IN DESIGNING THESE BAGS, WE HAVE USED A GREAT DEAL OF INPUT FROM OUR PRINCIPAL CUSTOMER: THE OFF SHORE OIL WORKER. WE HAVE AND WILL CONTINUE TO TRY TO MAKE THE BEST POSSIBLE BAG FOR THESE SPECIALIZED WORKERS. 10. IF YOU HAVE ANY QUESTIONS, OR WOULD LIKE MORE INFORMATION, PLEASE CONTACT US.